Easy and Vegan Chana Saag – Spinach and Chickpeas cooked with onion, tomatoes & spices makes a comforting meal. Serve it with rice or any bread of your choice. You know sometimes it happen that you eat something you love so much that then you don’t want to eat it again for the next few days. Happens with you? Like I told you guys, I went to this food conference last weekend and seriously there was so much food, especially desserts! We had waffles for breakfast, fruit tarts for lunch and cupcakes for dinner! And not to forget the popsicles and sorbet in between. Needless to say, I ate each and everything and now I clearly feel very fat and unfit. I mean I love sweets but right now, I feel like taking a break from all sorts of desserts and eat some greens. If you have followed my blog for a bit, you would know I love spinach and all things green. Yeah it’s totally weird that I love two totally opposite things – desserts and greens. 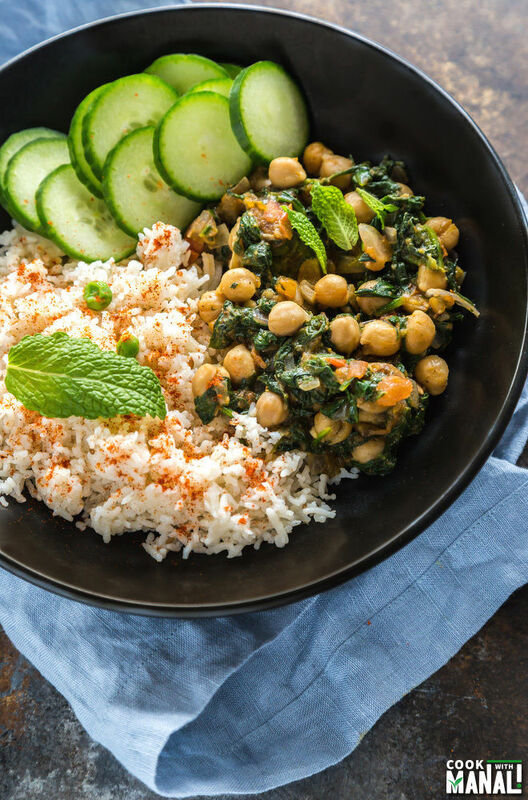 Chana and saag are becoming quite popular in the US these days. I see packets of frozen/read to eat chana saag or saag paneer in many grocery stores these days. Saag in India usually means a mix of greens like spinach, methi (fenugreek), bathua, sarson (mustard greens) etc. However a lot of time only spinach is also referred to as saag. 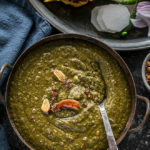 I made this chana saag recipe really simple for you. I used a spinach blend which I got from Trader Joe’s. It of course had spinach but also had mustard greens and pak choi which made the saag so much more flavorful. To cut short my cooking time, I used canned chickpeas, you may well use raw chickpeas. 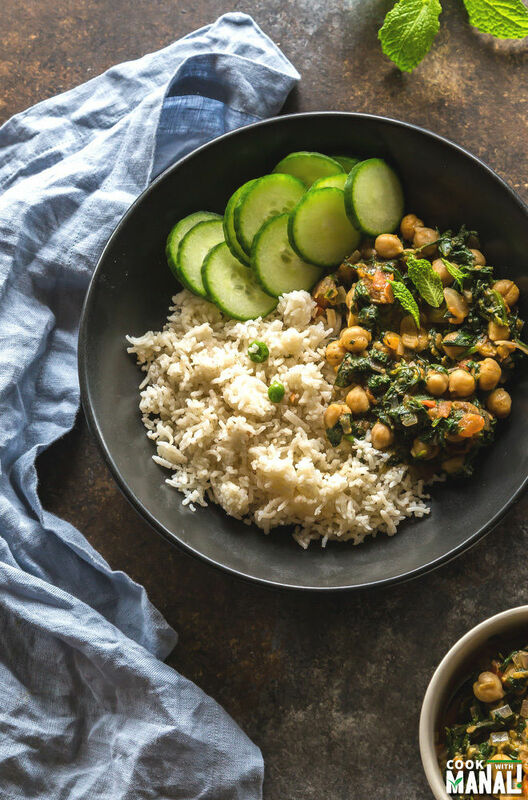 This chana saag recipe is vegan, gluten free and comes together rather quickly. A quick weeknight dinner which is ready in no time and it’s healthy too! If you can’t find this spinach blend, simply use spinach in this recipe. The first pic is just to show you guys the spinach blend that I used. You can use only spinach as well but it’s more flavorful when you use a mix of greens. This one from trader joe’s has spinach, pak choi and mustard greens. You may use methi (fenugreek) and bathua as well. Place the spinach blend in a pan and add little water to it. Boil for few minutes till the spinach starts to wilt. Immediately remove the spinach from pan and place under cold water and then chop finely. Heat oil in a pan. Once the oil is hot, add cumin seeds and let them crackle. Then add grated garlic and saute for few seconds till the garlic starts to turn brown. Add chopped onions now and also 1/2 teaspoon of salt. Saute for 1-2 minutes or till onions turn translucent. Add chopped tomatoes and mix. Cook for 2 minutes. Add curry powder, red chili powder, garam masala powder, cumin powder and salt and mix. Cook for 2-3 minutes or till oil starts oozing from the sides of the masala. Add the chickpeas and cook for a minute. Now add the chopped spinach blend and cook for another minute or so. Add the coconut milk and let it simmer for 3-4 minutes. Sprinkle garam masala on top and serve chana saag hot with rice, naan or any bread of your choice. You may also squeeze in some fresh lemon juice before serving. * You may use regular milk or heavy cream in place if not vegan. * You may adjust the amount of coconut milk in the recipe. Add more for a thinner curry. Spinach and Chickpeas cooked with onion, tomatoes & spices makes Chana Saag a comforting meal. Serve it with rice naan! Then add grated garlic and saute for few seconds till the garlic starts to turn brown. Add chopped onions now and also 1/2 teaspoon of salt. Saute for 1-2 minutes or till onions turn translucent. Mmm this sounds like my kind of dish! I love the combination of spinach and chickpeas. Sounds like this has so much flavor! 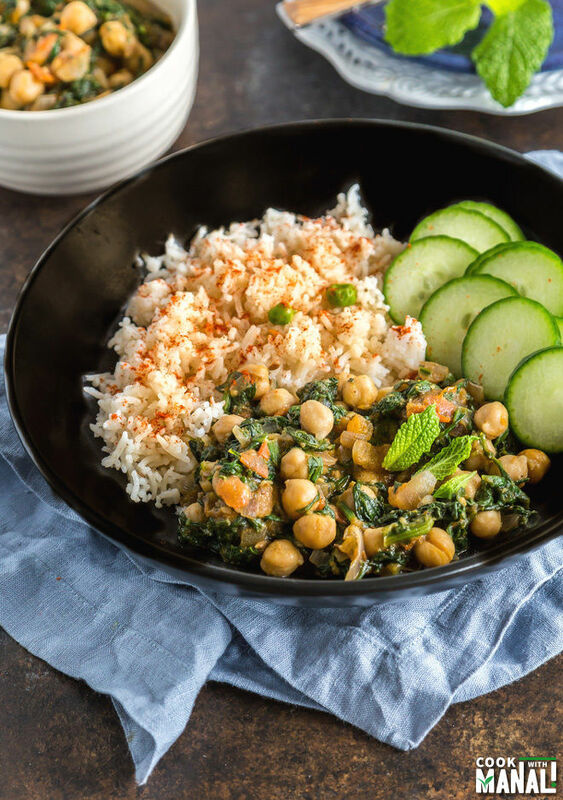 Love both chickpea and spinach…this looks healthy and so delicious. It’s so easy to make curry vegan, isn’t it. This is a perfect example of how delicious it can be too! You make the best-looking curries, Manali! Chickpeas and spinach are such a lovely combination. I’d love to try this!! I can definitely get sick of a food if I have it too much, especially at the holidays. I’ll have a slice of pie too many and decide that I really don’t want anything that sweet for a long while. I’ve had this at restaurants, but I’ve never made it. And it looks so easy to put together. I’ll have to try it. I love that it’s vegan! Oh I adore chickpeas, so combined with some spinach and spices sounds amazing! Love that this is healthy but doesn’t skimp of flavor! Cheers, friend! This is such a perfectly balanced meal! The more green, the better! I love the new design of your blog, Manali! So easy to maneuver through! This dish is fabulous! 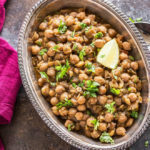 I love anything with chickpeas! Bring on the greens and chickpeas! I love your new site! This looks delicious! 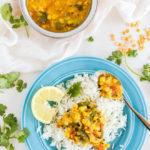 I love palak and chana – such a perfect comfort food! Love this palak chana. So flavorful and so delicious and comfy meal. I love dinner like this, Manali! They’re quick, easy and loaded with fresh veggies and greens. Sounds delicious! This looks so yummy, Manali! I just bought some cans of chickpeas, so now I know what I should do with them! This would be the perfect dish to make on this rainy day! 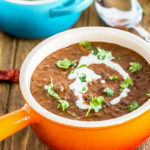 Recipes like this make cooking for my vegetarian wife a breeze! There’s an allergy to coconut and nuts in our house. Any idea whether something would work as a substitute for coconut milk? Thanks. You can use regular milk in place! Just made this but substituted mustard greens and Swiss chard mixture for the spinach, and a can of tomatoes and green chili for the fresh tomatoes. It is delicious! I loved this, delicious. I had always ordered this at my favorite Indian restaurant, and it was green, chickpeas in a semi-smooth green sauce. I would assume the spinach was pureed. Could I adapt your recipe to mimic that style prep? 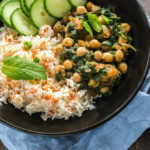 maybe use the spinach base in these recipes: https://www.cookwithmanali.com/palak-tofu/ https://www.cookwithmanali.com/palak-paneer/ and then add chickpeas to it! This was delicious. Even using 2 hot house tomatoes in February it tasted great. I didnt have the cumin seeds and was a little light on the fresh spinach. I used a little more garam masala and 9 TBS coconut milk too. Never the less, I thought it was the best.